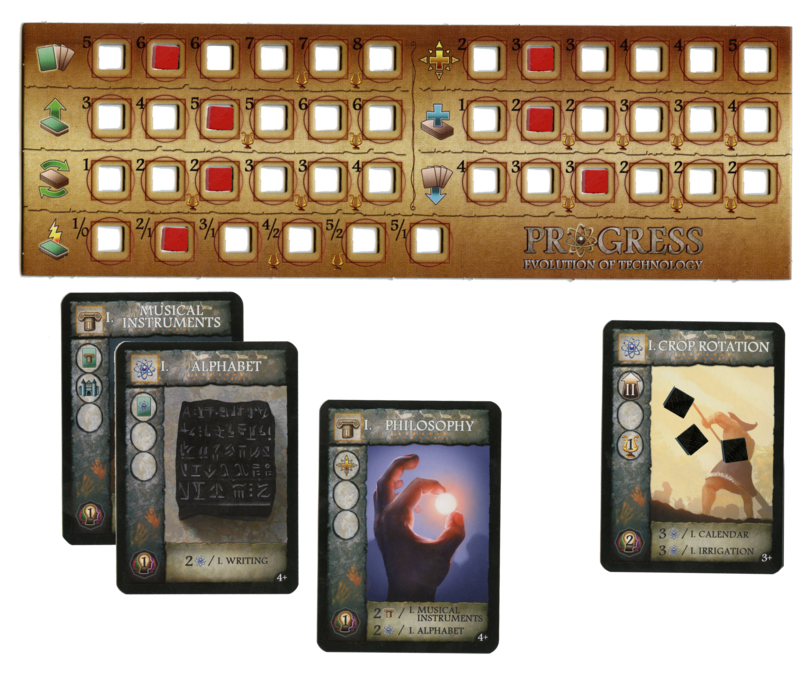 In Progress: Evolution of Technology (“Progress”) players manage a hand of cards in order to develop technologies as they progress through three (and four with the Modern Age expansion) eras. The player that is best able to balance their many scoring opportunities and produce the most advanced technologies is the winner of the game. At the start of the game, players draw five or more cards from the Era One deck (players going later in starting play order draw more cards) and use these cards in order to take two of five available actions, namely: discovery, research, quick draw, shuffle and draw or straight draw. The first action is discovery, and this actions forms the backbone of the game. Through the discovery action players can place a card from their hand into their active technology tableau. 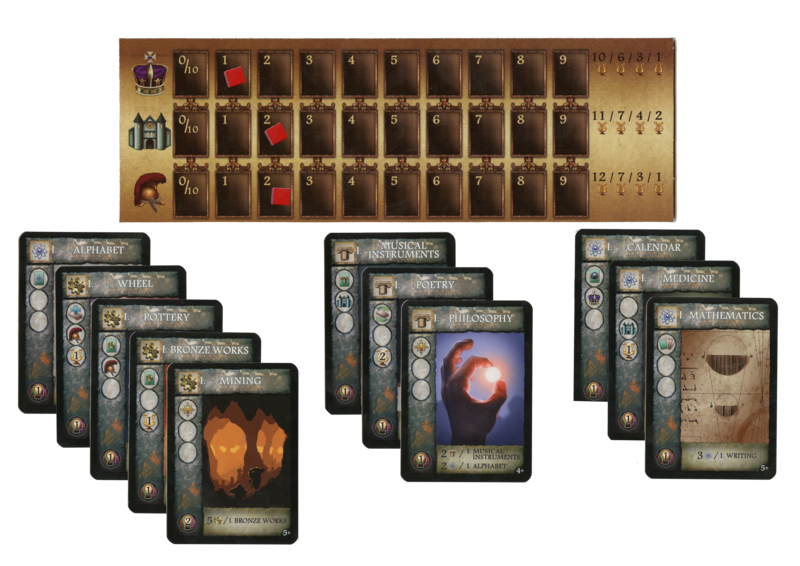 Cards are placed into the tableau buy paying their discovery cost, through either previously placed technology card, discarded technology cards, progress tokens or a combination of the three. In the example below, the medicine card is being played. 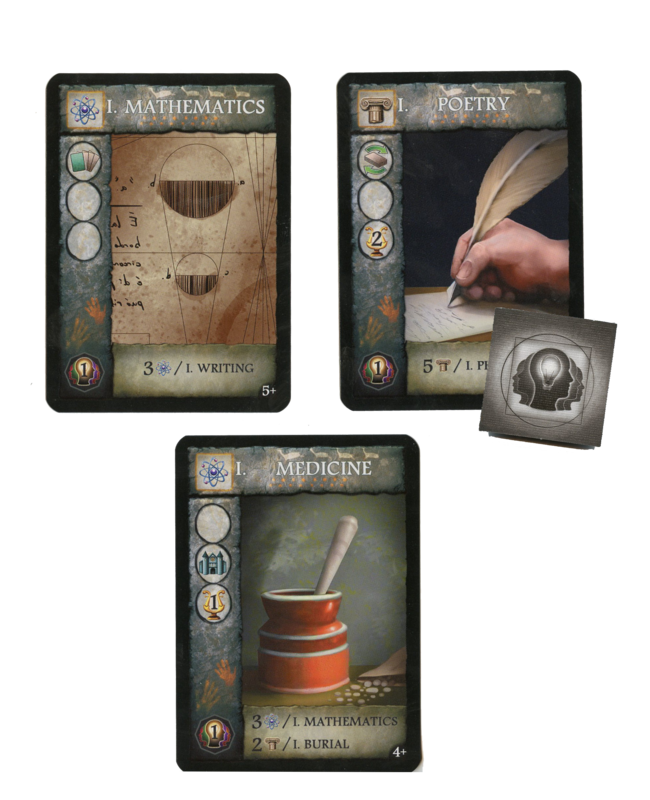 This technology card as a cost of three science units and two culture; however, the science cost can be foregone in the player seeking to discover medicine has already discovered mathematics and the culture cost can be foregone if the player has already discovered burial. Here the player has already discovered mathematics so the science cost can be ignored. But since he has not discovered burial he must pay the culture cost. He does so by discarding the poetry card, which has a knowledge value of 1 (knowledge is wild) and exhausting a knowledge tile he obtained earlier during the game. Once a technology is discovered its rewards are granted immediately, except for victory points which are supplied at the end of the game. In the example above, he was able to move his scoring token up one space on the population track. He will also gain one victory point at the end of the game. Other rewards the players can obtain for discovering technologies include advancement up the player’s ability track or the receipt of science, engineering, culture or knowledge tokens that can be retained and used to fuel future discoveries. Notably the tokens are refreshed after every turn, so they can be used over and over. Players may also place technologies under development. This is done by placing a technology card face up beside the player’s active tableau and placing four, three or two black development token on top of the card, depending upon how far up the research track the player has advanced. Thereafter, the player will remove one token from the card at the start of each round and will place it into play without paying any cost at the start of the round when the last development token is removed. Once a technology is developed it goes into the players active tableau and the player is awarded all benefits associated with the card, just as if he had discovered it. Player may also quick draw off on any deck that is in play, including face up discard decks. During a quick draw, the player draws a number of cards equal to the number affiliated with his advancement up the quick draw deck and discards a number of card equal to his related discard number, i.e. 2/1, 3/1, 4/2. A player may instead, shuffle a number of discard piles into the active decks and blindly draw an equal number of cards from those decks. As with the quick draw number, the number of cards the player may shuffle and blindly draw using this action equals that player advancement up their shuffle and draw track. Finally, a player may blindly draw three to six cards off of the draw deck, provided this is their last action and they discard down to their hand limit of five to eight, with each of these limits depending upon how far the player has advanced up their draw and hand size limits. After a set number of cards identifying an era symbol are revealed had put into play the next era’s deck is “opened” and cards may be drawn from that deck. Once all of the decks have been opened and a set number of cards marked with a gaming ending symbol are put into play, the game ends and final scoring begins. Players are scored on how high they have advanced up each of the tracks on their personal player board, how many victory cards they have played and how high they have advanced up the political, population and military track. Players ranked higher up the track score more points than those ranked lower. After all scores are tallied the player with the highest score, is declared the master of technology and the winner of the game. 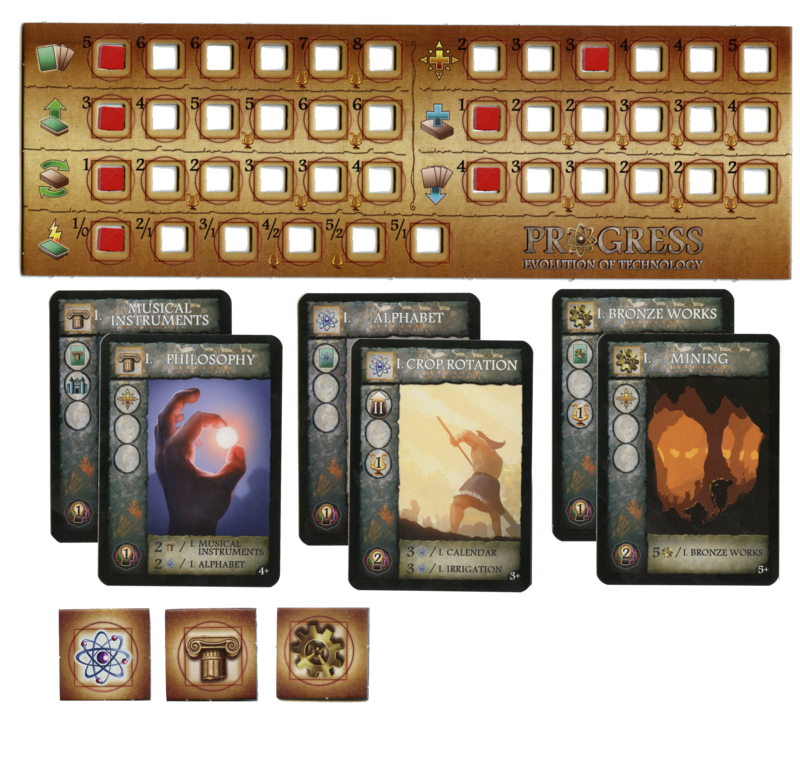 Progress, is a finely crafted game, starting with its impressive art and components. While largely utilitarian, the components serve their function well and make game play easy and efficient. For example, all of the individual player board feature cuts out in which the tracking tokens nestle neatly, making it unlikely that these tokens will slide off of their mark. Additionally, the icons on the cards are clear and distinct making it easy to track progress and scoring. The game also comes with five player guides (flowcharts actually) that, though difficult to discern at first, become very helpful once player become familiar with the game. These player guides provide quick reference to the number of cards of each type within the deck as well as the various cards that combine to produce more advanced technologies. This tool, though necessarily large in game where usable player space will rapidly become a rare resource, is essential for players hoping to play the game at its highest level. Knowing development prerequisites, discovery rewards as well as card distribution will help players maximize the utility of the powerful develop action and plan routes to easy late game discoveries. The components actually reflect the game play very accurately, which is easy and efficient. While the tactics of Progress are involved, the game mechanics are easy to grasp. The only facet that may prove difficult for some player to grasp are the options that can be used to discover new technologies, but a few examples should clear up any confusion in short order. What makes Progress work is the depth of choices that it offers. Every play has possible consequences and potential rewards. Players can tailor their strategy to both to the cards that they draw and their competitor’s moves. And, if they want to be successful, they must. At times, the game will suggest a limited set of viable options to the careful player. However, these choices are not so limited that the game ever seems to devolve to auto pilot. To the contrary, even when the choices are limited, no one choice is optimal. As a result, the game rewards the attentive gamer, but it also requires players to occasionally make bold decisions. The games is also engaging throughout. Though players will perform several actions at a time, except during the late rounds, turn order typically rotates fairly rapidly. (The game will slog down during late rounds while player are “mathing out” their options, but this is typical of games of this sort and in my experiences, by that point, players as so engaged in the emerging endgame, delays rarely become tedious.) Moreover, players will want to watch their opponent’s plays as the cards revealed by one player will influence the moves made by another. Additionally, since the players can draw from the discard pile, keeping track of where cards fall within the stack can be important. In other words, the game never feels slow, boring or tedious; which cannot be said of many other civ builders. The game does have some quirks, including an immediate endgame that can feel deflating to those players unable to take their final actions. Moreover, the game does involve a good deal of luck. I have had games where one player obtained a vast majority of the best cards at incredibly precipitous times. But this is not what I would describe as a problem with the game, just a reality with which the player will have to occasionally make peace. Usually every player will get one of two lucky draws and one or two garbage draws per game. Moreover, when all the game is played out over four, instead of three eras, the balance of good to bad luck becomes, predictably, more balanced. The game also has uncommon variability, especially for a card game. When one considers that Progress consist of three (or four) large decks of cards, these decks contain limited repetition and the game can easily hold two to five players (the game does have a solo variant; however, I have not yet given this variant a try) the possible variations are immeasurable. Moreover, card draws dictate game style, so most players will be forced to employ a different tactic each time that they play. In sum, the game continues to feel fresh and challenging even after many plays. Finally, the games implementation of theme cannot be ignored. One of my favorite things about early plays of Progress was discovering not only the technologies, but their interesting prerequisites. For example, philosophy derives from an alphabet and musical instruments and atheism derives from education and modern art. The game is intelligent and carefully crafted. As a result, the theme pervades in a game that could, if designed by less skillful hands, be flat, abstract and lifeless. I have yet to win Progress, and I have played it numerous times, at all player counts. While this is not an uncommon development, what is less common is my continuing desire to regularly get this game to table. Anyone who knows me knows I love the new, and while I am not one to shy away from a challenge, I often find that after five or six losses, my vigor can wane. That has not yet happened with Progress. And this speak volumes about the enjoyment I derive from playing it. All in all, I would describe Progress as an impressively designed game that deserves broader distribution. It should be said, that not all of my game partners share my enthusiasm. None of them dislike the game, but some suspect the game can be “solved”, an assertion with which I vigorously disagree. I have seen many different tactics lead to victory and just as many lead to bitter defeat. Regardless, I believe most players will get many enjoyable and challenging plays of this games under their belt before settling into a preferred strategy. Progress was the product of a successful kickstarter. Unlike other kickstarters, the publishers included all of the stretch goals within the base game which has become available at retail. I commend them for this decision, as it give the base game more depth and variability. The game comes with a fourth era (which we have taken to playing every time) and a number of expansions. We have not discussed the expansions in this review; however, they are worth using and add slight wrinkles to the game that help keep the game fresh. None of them add significantly to the game, but all are worth exploring. I really enjoy how fluidly the game plays. There is something very appealing about a game where all of the parts seem to fit. Progress is such a game. The balance seems perfect and the choices are occasionally grueling (in a good way), but every action creates new synergys (that’s right middle managers, I said synergy) that open up new game play opportunities. Being a generalist is not an ideal strategy in this game (since that this the tactic I tend to use, and as noted above, losing seems to be my fate when it comes to this game) (and to be fair, many other games). Players have to identify a tactic that they want to employ and use it until game conditions demand otherwise. This appeals to me as a gamer (which is not to say I am good at it, see above). I like games where players have to set goals, obtain them, re-asses, set a new goal and so on. Progress seems designed so that players are encouraged to do this. As noted above, Progress does have an immediate end game trigger and some of the people with which I have played this game, identify this as its principal failing. I take a different view, if players are aware of this possibility they should keep track of the approach of these conditions and structure their game play accordingly. This facet of the game gives Progress a modest, “press your luck” element, that I tend to enjoy. This game can take up a surprising amount of table space. While the designers recommend that players stack their cards as shown in the examples contained above, this mitigates but does not solve this problem. Add to this the presence of sizable player sizes and players may need to take out small leasehold in order to play this game without feeling cramped. The point being, though the style of this game is suited to cafe play, its footprint is not. When marketing this game, the team at NSKN Games describe it as the best part of civ builders, the tech tree, in concentrate. This is a precise description of Progress’ nature and appeal. For some reason, the theme of this game clicked with me, right away. As a gamer who always choose a trip to EPCOT over a trip to Disney World as a child (I grew up about an hour from both) a game that focuses upon technology, is always my groove. This game has cool technologies that are represented through attractive illustrations AND a flow chart. What well heeled geek wouldn’t love that.